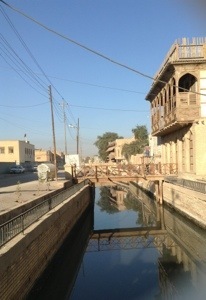 After the aforementioned trip to Basra, I arrived safely home Monday afternoon and this is the first time I share my experience in writing. A rare feat for me, as I always manage an email or a journal entry along the way. This time, we had an exceptionally hectic three days; talking some 48 hour for my first day, with overnight travel, and twenty hours the second! 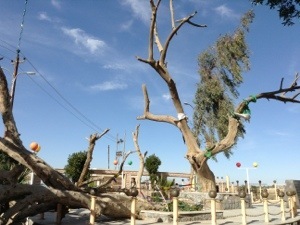 First thing that comes to mind is arriving into Basra International airport at 07:30, greeted by Nadwa (head of Living Light International organisation) and Abu Haidar, the new driver assigned to her by Basra’s governor; who is also housing Nadwa and I in the charming and (more important) secure guest house. 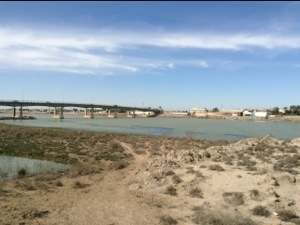 We drove to al-Shanasheel area. 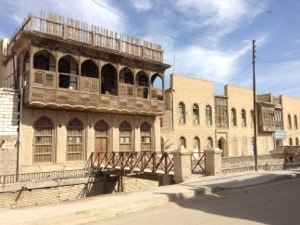 The name comes from the old houses, known as shanasheel/ شناشيل, which are characteristic of Basra’s vernacular architecture. 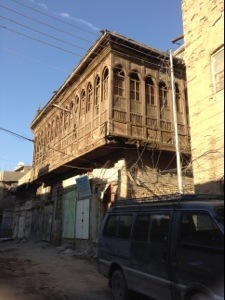 The area is beautiful, even if these delicate Ottoman structures are largely dilapidated, they are generally still lived in. 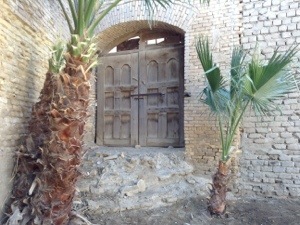 We’d gone to Shanasheel to visit the archaeology museum- not for its artefacts of which there are none left after the 2003 Gulf War looting- but for its garden. 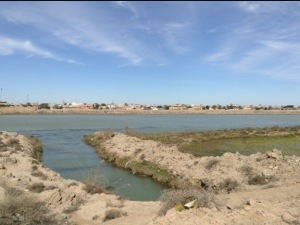 Formally a littered area, it has recently been cleaned by Nadwa and the Municipality of Basra; ‘we couldn’t see the ground for the rubbish heaps!’, said Abu Haidar. On the streets, I was glad to see rubbish bins placed to help deal with the ongoing litter problem. 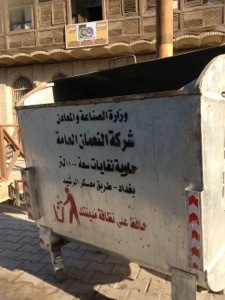 ‘People don’t have any respect for public spaces’, said Abu Haidar, ‘look, here’s a bin we installed last week, with rubbish all around it!’. It was too early for the museum, but I had a chance to visit it on the third and final day (photo’s below). 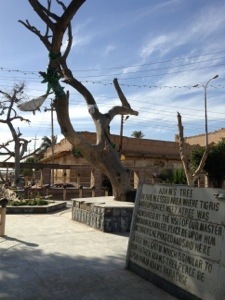 Saemar/ سيمر was our next stop. 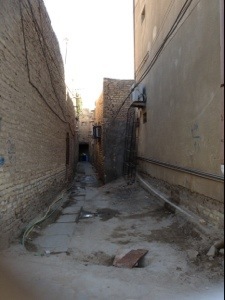 An impoverished area, though for me, it was my first glimpse into Basra’s quotidien life. We met a few children, who’d worked with Nadwa on the ‘I am the hope’ film, and who then tagged along, curious as to my fascination with their everyday environment. 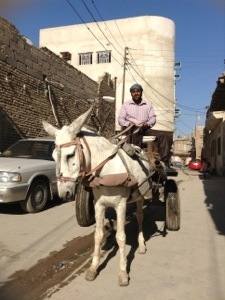 We came across a man having his haircut, the bakers making flat bread in the kiln, the gas-man on his donkey cart, with a cigarette between his lips, the shy metallurgist, and even a random passerby who insisted I take his photograph and his full name. And of course the shanasheel houses. Some had been amputated and replaced by modern metal windows, others were sealed with wood, some were left to rot…I don’t have a sentimental attachment to these, and I’m more aware of the people suffering than their buildings, but it is sad to witness their decay. My 1960’s block of flats in London is a listed building, and these historic, majestic structures are left to rot. There are so many stray dogs and cats, and a few times I tried to feed them- putting a morsel of bread nearby- and they bolt As fast as their fury legs can carry them. I dread to think of the suffering they have experienced. ‘We don’t have respect for one another, why would we have respect for public spaces?’. Fayiz, the film director arrived, and we were all invited into an open office-y room by a sweet old man, who served us tea, and after Fayiz shared his vision for the film with me, I had a chance to listen to the old man reminisce about the olden days. I asked if there are still Christian families living in the area. ‘Religion. It is religion that has divided everyone. Although having faith in God is akin to having faith in humanity and should bring people closer, but this modern-day religion segregates women and divides people’. 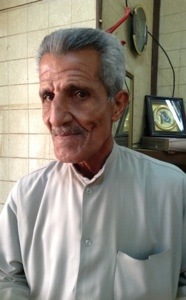 I wanted to stay and chat, to meet more of his elderly friends, but I was summoned to join Nadwa and Fayiz. We had a very long wait then, and after some two hours of faffing, being with children and being asked questions, I was bored. Bored and exhausted from my overnight flight. I went into Umm Karrar’s house, a warm and generous lady whose front yard we were squatting in, and asked if I could nap on her living room sofa. ‘This is a brand new blanket, so you can be sure it’s clean…yes, you look very tired and pale, you’ll do well to have a lay-down’. 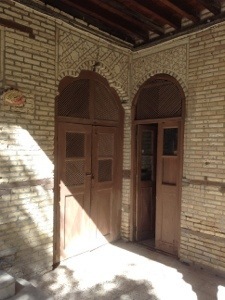 Her two daughters, Fatma and Zainab, brought pillows and closed the curtains. Their living room was a generous size, quite simple and, as I lay down, realised it overlooks the yard area where all the kids and camera crew were…so I could hear, on repeat, the two main songs in the musical film with a karaoke-esque chorus of screaming children. I remember my body’s mix of exhaustion and frustration manifesting in nervous jitters. I finally put on my i-Pod, with a dhikr/ ذكر (meditation chanting) of al-Hadi/ الهادي, and I proceeded to breath and silently chant along with the live recording. Didn’t sleep, but the jitters settled. Side track: as a teenager I was invited by a Sudanese friend to accompany her to a Saudi Arabian wedding, at London’s Dorchester no less. I arrived into a big hall of the most florid coloured ball-gowns, with the bulgiest of bossoms, exposed backs and poofed-up hairdo’s. At one point, whispering revealed that the groom and his father will be coming in for photo’s. My friend asked me to wear my cardigan- even though knowing it was a Saudi wedding, I’d worn a below-the-knee dress with long sleeves- in the few seconds it had taken for me to put on my cardi, the room had transformed into black robes with many pairs of beady black eyes. Only the bride was left in her white meringue, posing for photo’s with her groom and father-in-law. So the Basra girls’ drawings made me wonder of the segregated sexes culture that is now prevalent in Iraq. More waiting followed until we were told the filming will take place at an archaeological site. ‘one other, baggier, pair of trousers and one t-shirt’. No one was impressed with my frugal packing. My bag was filled workshop materials, namely, egg shakers, sketch pads and pencils, and silk veils for meditation. 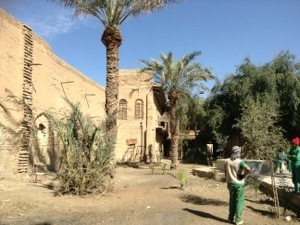 At the archaeological site, they preceded to film the scenario. I wouldn’t go into it here, as yet again, this is proving to be the mother of all posts, suffice to say, in the film, I lead an excavation, which then transforms into the workshop space. An incident with a policeman and soldiers later, and we finally drove home. I was so shattered, I couldn’t even have a de-brief with Nadwa. I just remember setting my alarm for the next day, at 2:30am, and saying a brief prayer of thanks, as I fell asleep. So 2:30am, I woke, unpacked, dressed, ate an energy bar and headed out to meet Nadwa. The early start was to catch the sunrise at the tamr l’Sihi/ الطمر الصحي, the dumpyard area, where some of the workshop children lived. This is where I’d be dressed as Sumerian Queen Shab’at, and where digital effects will be added to transform the dumpyard into the ancient city of Ur. I’m keeping an open mind. 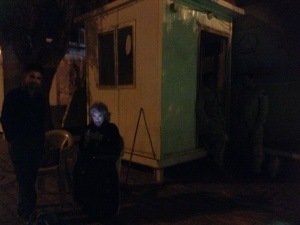 All the people, who were meant to meet Nadwa and me at the mayor’s guesthpuse/ دار الاستراحة, were late. 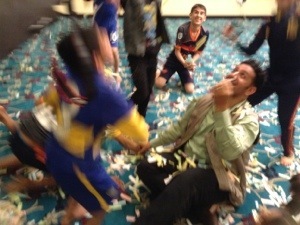 All apart from Nadwa’s main man, the wonderful Husam. We waited outside in the cool darkness. There was much expression of anger and frustration from Nadwa; whose face, lit by her mobile phone, is the only visible feature in the photo. Finally, the troops were gathered, apart from the director, and we arrived at the dumpyard by 4:45am. 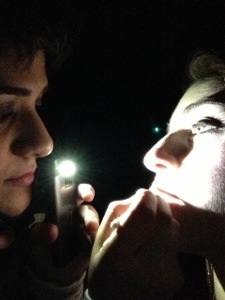 Samar, who had volunteered to dress and do my make-up, was very much on the ball. We had nowhere to dress apart from a wooden warden’s room, without light or heater. It was windy, cloudy and cold. 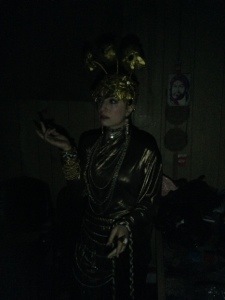 So, with a donated mobile phone’s light, we began to get into costume. Samar had spent the previous evening trying on the costume- designed by Ziyad, a costume designer with an interested in historic costume- and choosing from her own collection of ‘faux-bijoux’ to glam me in. I think, given the conditions, she did an incredible job. She’s a Human Resources manager in her daytime job…I was very impressed. When all the dumpyard filming was done, I gave out chocolates to the kids- apart from workshop material, I brought a lot of chocolate for the kiddiwinks- and we drove for lunch. I was so glad to rid myself of the uncomfortable head-vice of a crown. 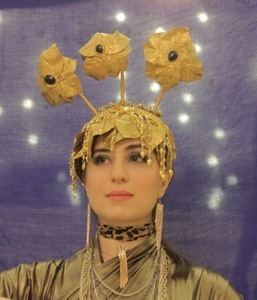 There was a metal clip, holding the three protruding flower-y things up, that literally dug into my brain. Horrid. 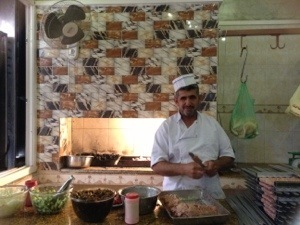 At al-Arnab al-dhahik/ الأرنب الضاحك (the laughing rabbit) I had my first Iraqi shawarma qus/ قص (an Enlish ‘keebab’) in19 years! 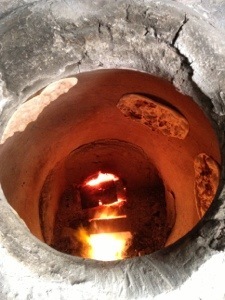 The taste was different than the Lebanese version because of the date vinegar pickles and amba/ عمبه (a kind of relish). Washed down with a bottle of shineena/ شنينة (a savoury yoghurt drink), I felt ready for a nap. 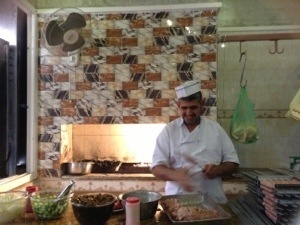 I took a photo of the man making kebabs (the minced meat on a skewer kind, not the English keebab). I was given a naturak chewing gum to chew, which was very bitter, so I must have had an odd expression on my face. He asked me if I liked it, and I said I preferred mastic gum/ علك ماء. He asked if I’d be visiting again the following day, so he can get me some mastic gum. 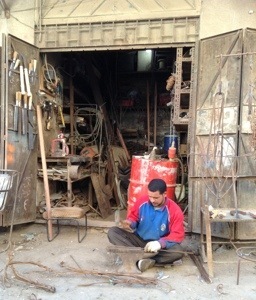 I said I had no idea what the plans for, and thanked him for the generous offer. Never seizes to astound me how randomly generous and thoughtful people can be here. After some strong Iraqi tea, served with two generous spoons of sugar, in the traditional dainty gold-rimmed istikans, we drove to the Sheraton Hotel to continue the filming. 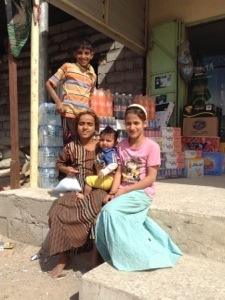 I waited with some of the volunteers, as Nadwa, Husam and Abu Haidar went to pick up the Saemar kids. Meanwhile, I was introduced to the head of the local drama school, and two tutors. They asked about the workshop, and told me a little about the acting exercises they’ve been experimenting with. Sounded very Russian to me, and reminded me of some of the stuff I did in Moscow’s Boris Shukin Institute, as part of my own drama school training. I was impressed and intrigued to hear more. Sadly, I only had some fifteen minutes with them, as Nadwa and the kids arrived so returned to work. They asked if I’d be interested in visiting, with the intention of giving the student a specific workshop for them; I said I’d love to on my next visit. God willing. For the second part of the filming, I was asked to lead the workshop, and that the camera crew would film aspects of it. They will have to stop me to take different shots, close-ups and whatnot. This lasted for some three hours, and in many ways, was a lot harder than just running an ordinary workshop. The workshop wasn’t closed, and literally people walked in/ out, chatted in loud voices, more volunteers walked in to enthusiastically greet the kids…at one point, a tray of sandwiches was brought in, and the loitering crowd dug in as they chatted and watched the workshop. Also, I did not want the kids to mindlessly to as they are told, to pretend for the camera- as they had done the day before at the archaeological site- so my challenge was to be fully in control, to carefully manipulate the workshop activities for the director’s filming demands. 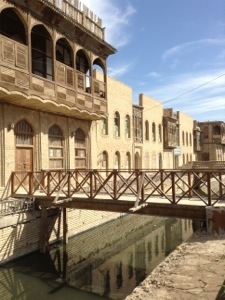 This is very different to how I’d previously led workshops in Basra. At one point, maybe for a straight fifteen minutes, we all maintained a variation on basic hand movement- a gesture suggested by the director to symbolise imagination- so the camera can zoom in on the 14 or so participants. I was very impressed with how they maintained their focus. When my bit was over, instead of the usual checking-out, where everyone has an opportunity to share reflections on their experience, everyone was unleashed to play with confetti- used in the filming at some point- eat their sandwiches, play fight, as I quietly took my sandwich and water to vegetate on my own in a corner. Rocking myself like a woman in bedlam…no, I wasn’t that bad. I did have to excuse myself from anyone who came to chit chat, ‘I’m recharging’ I mocked, though I must have looked terrible as all looked a tad worried and gladly gave me my space. 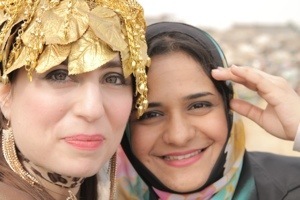 After some ten minutes, the kids were collected by Nadwa and Husam, to be returned to their respective homes, and I went back into make-up and the head-vice, AKA Queen Shab’at’s crown, to complete the filming. I walked, as regally as I could, through the Sheraton, as visitors requested to take photo’s with the dolled-up woman in gold. This bit was surreal and strangely enjoyable. I was also relaxed as I knew I only had to walk down the main steps a few times with the green blanket thingamabob held up behind me, for the digital post-prod shenanigans. We were done by 22:30. Literally a 20-hour day. Yet again, I went on auto-pilot, withdrawing into myself, as I was manoeuvred out of my costume and face, and into the van heading to my blissful bed. For the third day, I didn’t need to be ready until 9am. However, a beautiful stream of sunshine had flooded the room to wake me up before 7am. 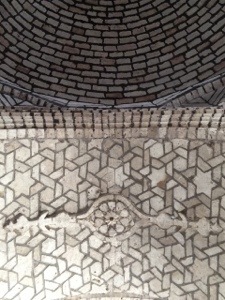 I was glad to get up, shower, in a traditional style Eastern bathroom (why didn’t I take a photo?!) and just stretched in the sunny patches on the floor, like my cat Pushkin does in our flat in London. 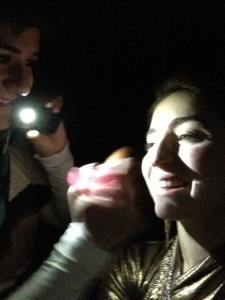 I suspected that Samar, the volunteer who had done my make-up, might have mentioned it was my birthday that day. I only mentioned it to Samar to establish an age divide, a boundary between us, when she was getting a little too stroppy with stress and fatigue. I was exactly ten years older than her- I still find that hard to believe I could be ten years older than a grown and capable woman! So a part of me wanted to insist that we work. 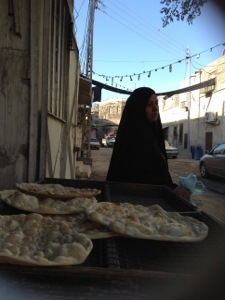 The other part fantasised about a road trip across Basra, eating masgoof (I’d yet to eat one proper hot meal in Basra!) and maybe even a swim in the river! Also, regardless if Nadwa was just being kind and thoughtful towards me or actually wanted a break, I felt it would do her good to take a little breather. No one would think it to look at her, but Nadwa has her fair share of health concerns. I am still in awe by how she manages to energise and enthuse herself for all her non-stop work, and how not a single grumble escapes her lips. I’m in awe. So we decided to be, as much as possible, on our own- including our chaperones, Husam and Abu Haidar, of course- but had no idea where we might go. 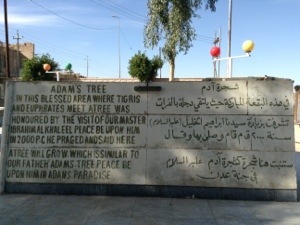 We met up with Husam, had a logistical chat, to work through the options, and finally decided to go to Adam’s Tree- an ancient tree, supposedly planted by Abraham, which is used to make dhikr/ and al-Qurna, the meeting point of the tigris and euphrates rivers. The marshes would have taken a lot longer, and we wanted to be back in time for possible more filming. 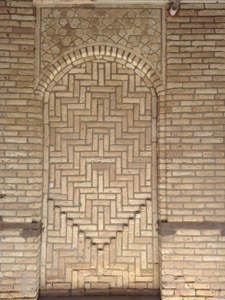 We made a quick stop at the archaeological museum, to inspect the garden, and that’s when I took the photo’s. We grabbed a falafel sandwich, to eat in the car, and who was to come running over to us? the kebab man! he had brought some mastic gum for me. Isn’t that incredible? With satisfied stomachs, we headed off on our road trip. Sounds like I could yap onto another couple of pages, but the time was spent chatting in the car, stopping to take pics, chatting some more, and generally switching off. Very much needed. 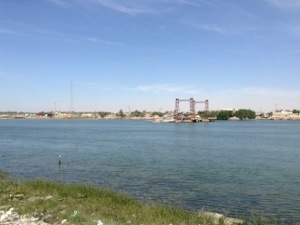 It felt good to connect with Nadwa a little more personally and to just chat with Husam, and get an inkling of life in Basra and differences in social norms and attitudes. After a phone chat with Fayiz, we were asked to rush back before sunset, to do more filming. 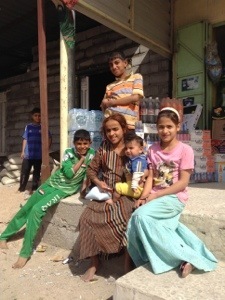 We picked up a handful of kids from Christian families. 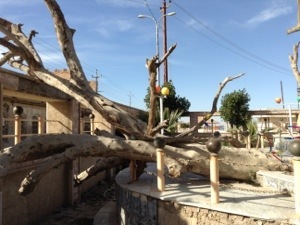 The director and Nadwa were keen to have kids representing a wide mix of Basra’s ethnic and religious population- what’s left of its former diverse glory- as the organisation doesn’t target any one group of people. The second half of the day was spent filming, first on a boat with the kids and the second at the Sheraton Hotel. After the boat, we had leblebe/ لبلبي a sort of boiled chickpeas individually seasoned with lemon juice and hot sauce. Delicious. I had three bowls. 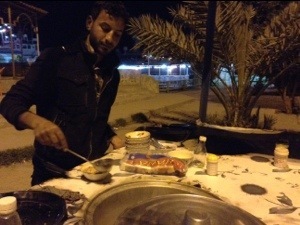 It was wonderful to sit overlooking the Arab Gulf, and for everyone, child and adult alike, to enjoy bowls of this street food. 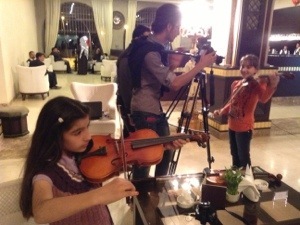 At the hotel, I was asked to mime playing the violin, as myself, as if I’m teaching the kids how to play in a workshop. I refused, and I’m unsure why, but it felt fake and unnecessary. My inner judgemental voice accused me of being a ‘difficult actor’- ‘an actor is a doer, not a thinker’, a director once told me, and our drama school motto was ‘an actor is a story seller’- and a tinge of guilt crept in. I struggled with the profession of acting as it seemed to constantly question and impede on my sense of integrity. I stuck to my decision, and fortunately I wasn’t pressured. I was asked to play the piano with the kids, and although I can’t play tunes, I was happy to mess about. I quietly did my own eccentric brand of improvised operatic singing with random piano playing- I did this for comic effect at a friend’s civil partnership last year- which the kids seemed to enjoy. I was mean enough to use it manipulate the kids’ good behaviour: ‘I will only sing if everyone is quiet and doesn’t bang on the piano’ etc. Very un-Gestalt therapy of me! I then asked them to echo, and so we, as quietly as we could, in the hotel foyer, sang together. Once again, I wished I was running a proper workshop with them. Finally, when all the filming was done. The kids had their sandwiches, followed by some chocolates from yours truly. 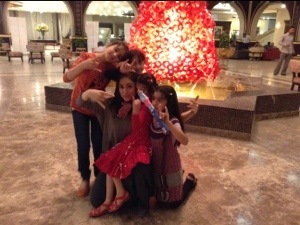 I bid farewell to the filming crew at the hotel, as we took the kids and ourselves home. At home in London, three days later, I’m about to heat some of that sweet bread, to munch on with black tea for breakfast, as I attempt to round up and conclude this particularly massive post. Believe it or not, I skimmed in parts, and still these seem far too many pages for a blog post, or are they? Not sure if that would make much of a difference to me now. Alas, any questions or comments are welcome. And do please put them on the blog-site itself, as I kept getting beautiful emails and tweets, with some interesting discussions too, but would love to share these on the blog site itself, so if you feel able, do please share your thoughts on this site. It’s lovely to read about the trip and the variety of things you did! It’s easy to forget what a great place this is. The random generosity of some of the people is heartwarming. I especially liked the Kebab man! Great photos as well. Where will we be able to see the final film once it’s finished? I hope you post a link at some point.